Some people use the DF to remember while others use the VS to remember. Personally, I use the VS. Both work. Line 1: DF is はらう VS is はらい. Drop the い (So, just はら now). Add って ( This is how we get the Te-form はらって). How to conjugate verbs (Ru, U, and Irregular), adjectives (i and na), and nouns into Te-Form. depending on the type of word you are conjugating. There are 3 main types of verbs + exceptions that each require different approaches. The same is true for two kinds of adjectives. Nouns will follow the pattern of なadjectives. 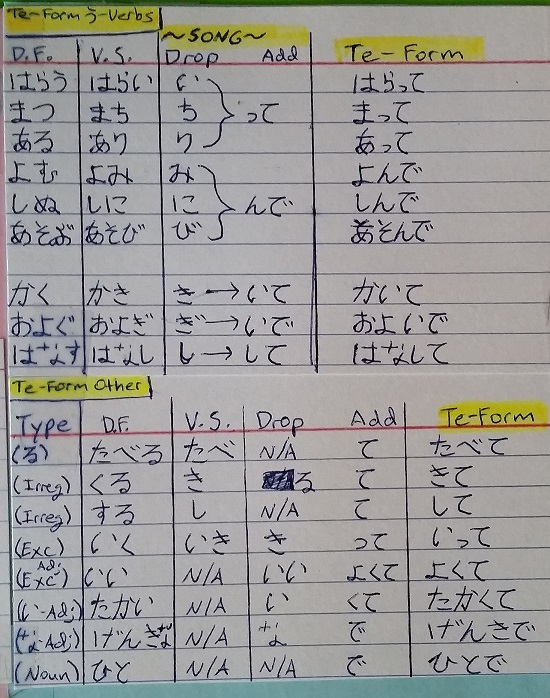 But then you still need to learn the rules for the past form, which are basically the same as for the て form. So you could just use this post and replace every て/で with た/だ. It has been a while for me. I am still slowly recalling things and only in chunks like the chart above. So, if you would like to add your own method here, that would be great! No your method looks good! I was just telling thecupcakefarmer that "just changing the past form to the て form" works, but that still requires you to learn the past form. And the past form is precisely the て form with the て replaced by the た (or で by だ). So my point basically is, you cannot get around learning the conjugation for one of these, so your post is very helpful for people who need to learn the conjugations!